What to do with all of those peppers in the garden? Here is a simple and easy method to use up all of those hot peppers – make fresh hot pepper flakes. We love them on pizza, eggs, or any other dish we want to spice up with a little heat and flavor. We even make different kinds of pepper flakes depending on the peppers that are ready to pick. 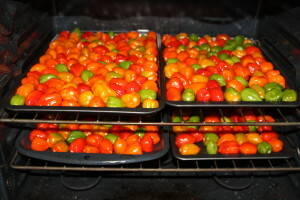 We have made cayenne, jalapeno, Cajun Belle and even Habanero (very hot!!!) flakes from all of our extra peppers. Many times we will use them all and make a mix. 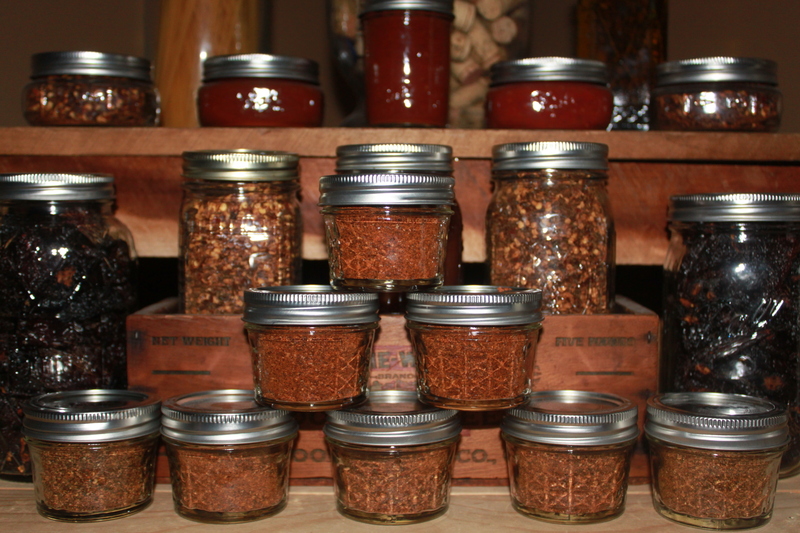 Much like you would do when canning – you want to select the nicest and best looking of your peppers for drying. Wash and rinse the peppers off, cut off the stem and then dry them off with a towel and place on cookie sheets. Here – four trays of Habanero go into the oven for roasting! We will let them roast on low for about 8 to 10 hours. If you have to leave – no worries – just turn off the oven and resume again when you come home – no harm done at all to the drying peppers. We will often dry them in the evening – and then turn off before bed – and finish drying the next morning or evening. When your peppers have turned crisp and dry (usually 8 to 10 hours – but it can be a few more or less depending on the dryness of the peppers) – take them out and let them cool completely. Then place into your food processor or food chopper – and in a matter of seconds you have fresh home-made pepper flakes. If you want to make hot pepper powder (like cayenne) – just simply take your flakes and run them through a food mill to remove the seeds – and your left with a fine powder that can be used in dishes, soups, and sauces. We keep some on the counter year round to use in everything from soups to eggs to pizza. 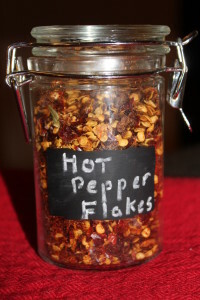 One last great use for the hot pepper grind – mix up a few teaspoons of hot pepper flakes or powder in a gallon jug of water. Let it stand for a day or two and then use a mister to apply to plants where bunnies or other critters can be a problem. One taste of the hot pepper on the leaves and they tend to leave it alone. Just remember to re-apply after any rain that might wash off the hot spray. Always wear rubber gloves to prevent your hands from absorbing the heat from the peppers – from experience – I can tell you that it’s no fun to have your hands hurt for days from handling raw peppers. When heating in your oven – you will definitley notice the smell and a little heat in the air from the peppers as they dry – we always keep a window or two open to help keep it from bothering us too much. 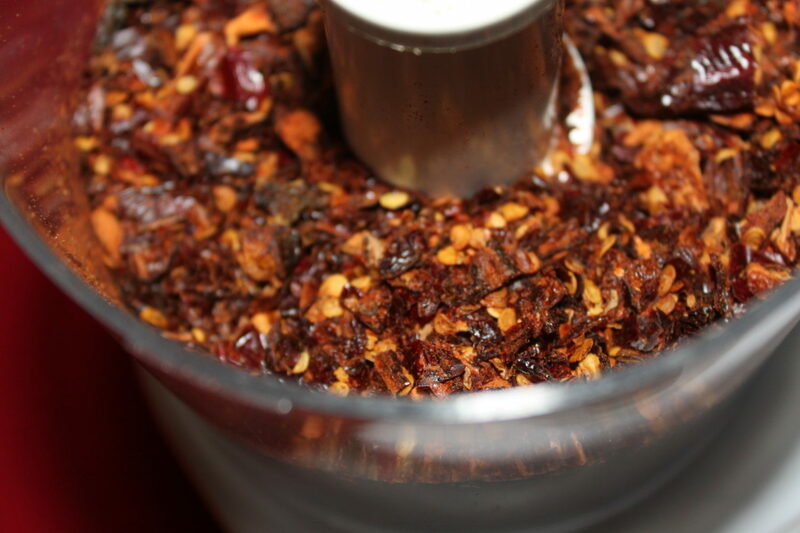 When grinding up in your food processor – we actually take ours to the porch back screened in porch to grind – just to avoid the sneezing dust that can come with the grind. oldworldgardenfarms August 10, 2012 February 5, 2019 Recipes, Sauces Dressing Jams Misc. what is the best use for the multi-colored Chinese peppers. They are so small & hard to work with to take seeds out.